More than 60 percent of small business owners with employees favor increasing the federal minimum wage from $7.25 to $10.10 in three stages, according to a new survey. The results from the poll conducted in June, showed that nearly 60 percent of small business owners say that raising the minimum wage would increase consumer purchasing power. Blacks disproportionately work in low-wage jobs, accounting for 11 percent of the total labor force, but more than 14 percent of low-wage workers. 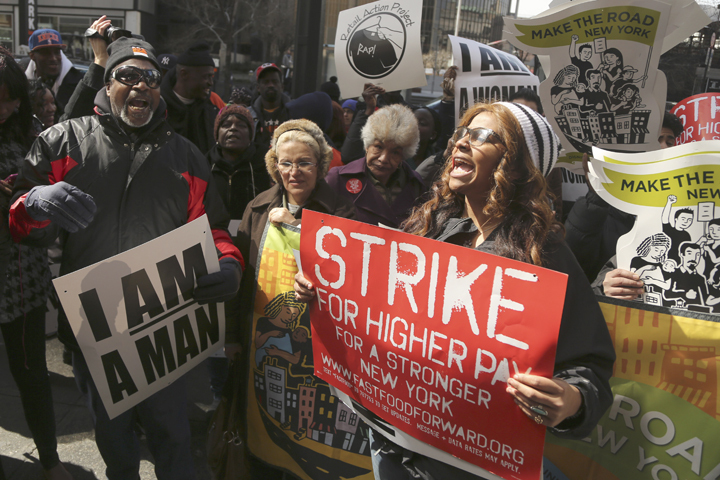 Roughly 57 percent of low-wage workers are White. Six percent of the business owners in the survey were Black and roughly 80 percent were White. Ninety-nine percent of all African American businesses don’t have eny employees. Sherry Stewart Deutschmann, founder and CEO of LetterLogic in Nashville, Tenn., said that because her employees well above the minimum wage, they have more money to spend with other businesses. The strongest support for raising the minimum wage came from respondents in the Northeast, where 67 percent of small business owners favored a higher wage. By contrast, less than 60 percent of small business owners in the South said they were in favor of an increase. For proponents of a higher federal minimum wage, the poll results undercut the argument that raising the minimum wage would hurt small businesses. Researchers have also dispelled that myth that many workers who get paid at or near the federal minimum wage are teenagers living at home and supported by their parents. Low-wage workers are more educated than they were four decades ago (about 30 percent have some college experience) and older (less than 15 percent are teenagers). A recent report by the Center for American Progress, a progressive, Washington, D.C.-based think tank, found that the stagnated federal minimum wage presents barriers to economic mobility for two key demographics. The report also noted that today the minimum wage at $7.25 is worth less now than it was 50 years ago when more than 250,000 Americans marched on Washington for jobs and freedom in 1963.